Liberty for Egypt: Instructions to Assist The Egyptian Vigilantes protecting the country. Instructions to Assist The Egyptian Vigilantes protecting the country. 1- First and foremost, stick together, this is obvious to most of you. Power in Numbers. 2- You will get tired soon, so divide yourselves into smaller groups and become more strategic when it comes to the places you need to protect in order to control the area. 2- Prepare Molotov Cocktails but use them ONLY when you must. To make a Molotov Cocktails: open a bottle, fill it with a flamable material like gas , and close it with a sheet of cloth which you can light if you need to but it has to be long enough to give you some time to throw it after its top becomes a piece of fire). 3- Chains make excellent weapons against thugs on bikes; Pipes make good weapons too. 4- Air rifles are NOT effective, you can withstand a blast at point blank range. 5- Get wood from Shovels or other varities, Hammer long nails through them, they make decent maces. 6- Use your car tires to blockade the streets. Light fire in them too, it will give you warmth and prevent any car from braking the blokade. Create choke points so thugs have a harder time getting in and out of your streets. Open the blockade ONLY when the army takes control. 7- Crush Lighbulbs inside cloth, Spread the glass on window sills. they Make noise and harm attackers. 8- Agree on a Distress signal, Give it ONLY to people you trust. 9- Rip Barbed wire from nearby gardens if available, use it to protect pressure points. 10- Keep a bucket of nails & a watcher approximately 200 feet after your choke points, if someone breaks though have someone Scatter the nails on the street. 11- In case you don't have nails, shattered glass works but is not as effective. 12- Open up manhole covers, Direct choke points towards them. 13- In the lack of nails, for cars you can use large sheets of cloth or cardboard to obscure vision of the cars, requires two watchers at 10 - 20 m after the choke points. 1. أولاً و قبل كل شيء، أبقوا متجمعين معاً ، هذه بديهية لأغلبكم، القوة بالكثرة. 2. قسموا أنفسكم الى مجموعات صغيرة حتى تتفادوا التعب. قوموا بالتخطيط الجيد لحماية الأماكن التي ستكمنكم من السيطرة على المنطقة. 5. البنادق الهوائية غير فعالة. 7. استعمل اطارات السيارات لقطع الطرق، اشعل النار فيها، ستكون مفيدة للتدفئة و منع أية سيارة من اختراق الحواجز. قم بإعداد ممرات ضيقة لجعل مرور العصابات أصعب. قم بإزالة الحاجز عندما يستلم الجيش و يسيطر على المنطقة. 9. اتفقوا على إشارة متخصصة في الحالات الطارئة، لا تعطي هذه الإشارة إلا لمن تثق بهم. 11. ابق كمية من من المسامير و مراقب على بعد 200 قدم من الحاجز، اذا حاول احدهم من اختراق الحاجز، يقوم المراقب برمي المسامير على الشارع. Nail long nails through 2 foot wide plywood to knock out the tires on cars you need stopped. Place them strategically at choke points. Get whistles to call for help, they are easier to hear then yelling. Agree on a specific whistle call or calls to indicate what kind of assistance is needed. Work your neighborhood watches in rotation so that your people don't get tired or bored. 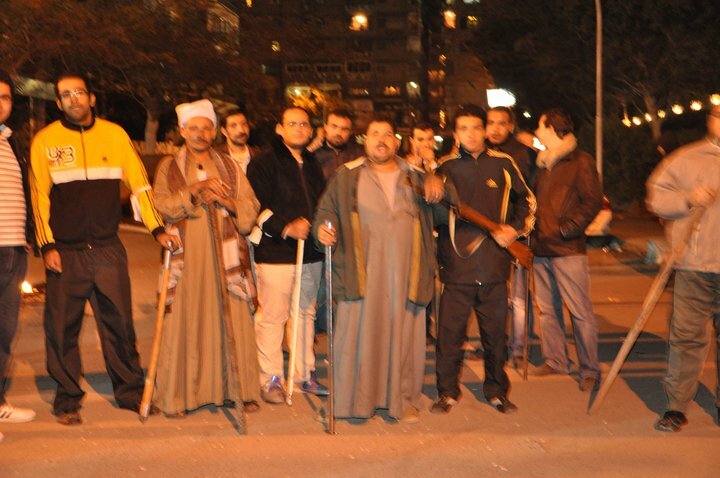 People take control of Egypt's Security.